I got a chance to try out the Slipnot Bicycle Tire Chain system. The results were a mixed bag. Ultimately they were overkill for my use cases, but I could imagine situations in which they could prove to be useful. I’ll run through the pros and cons below. 1) Provided you’ve measured your clearances properly [C1], they’re easy to set up and they’re easy to remove. After the initial setup, installation takes about five minutes per tire. Wrap them up, tighten the turnbuckle, and you’re good to go. 2) The tire chains cost about as much as a pair of traditional studded tires, but you only have to use them when you need them, so they should theoretically have a longer lifespan. Using them on a case by case basis can be a pro and a con, particularly with heavy freeze-thaw cycles and unexpected black ice. Studs are there in every case, but with the bulk and drag of the tire chains, you won’t want to use them unless you absolutely have to. The bonus, though, is extra speed during times you don’t need them. 3) They’re pretty good at shedding snow. The spacing between the chains is large enough that it doesn’t collect snow, so they are effective at really digging in when you need that extra traction. 4) They come with a mesh bag, so when you’re not using them, you can easily wash the salt and dirt off of them and hang them to dry for your next use. 5) They’re great with snow on the ground. I noticed significantly less slipping and sliding and had more confidence while turning. 1) They’re bulky. Before you purchase a set of chains, make sure to measure the clearance between your tire and every other part of the bike. 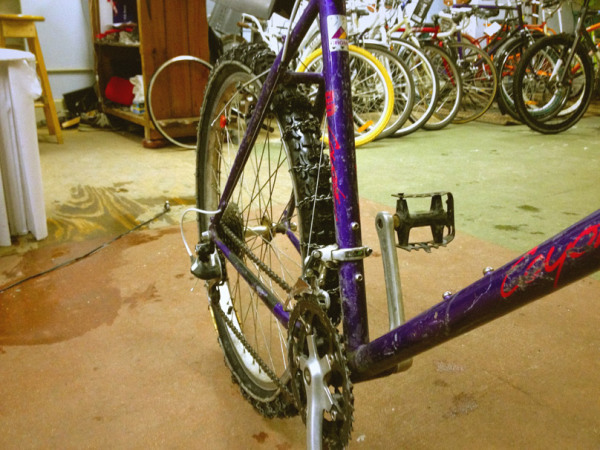 Be sure to check the seat stays, the chain stays, the brake bridges, the brake arms, the fender, the fender stays, etc. Everything. The chains will essentially add about a half a centimeter to your tire diameter. But since they have a tendency to shift over time [C2], make sure you have at least a centimeter of clearance around everything. If you don’t have that space, you can run smaller tires provided there is a tire chain size for that smaller size (for instance 26″ tires cannot be smaller than 1.95). 2) The chains wrap around and hug the tire, but beyond your tire knobs, there’s not a lot keeping them in place. This mostly works until they shift in minute ways and start rubbing on a brake arm or something. Then it’s really difficult to readjust the chains to stop the annoying clicking. 3) The Slipnot tire chains come in assorted sizes from, 20″ tires all the way up to fat bike tires (700C need not apply). My set was for 26×1.95-2.2. I managed to squeeze one set onto a 26 x 2.25, but it was a struggle. Then again, that snugness was reassuring. On the 2.2s they fit a little more loosely but install in a breeze. Despite the fact that they’re rated for 1.95s, running them on anything lower than 2.0s makes me nervous with too much chain flop. 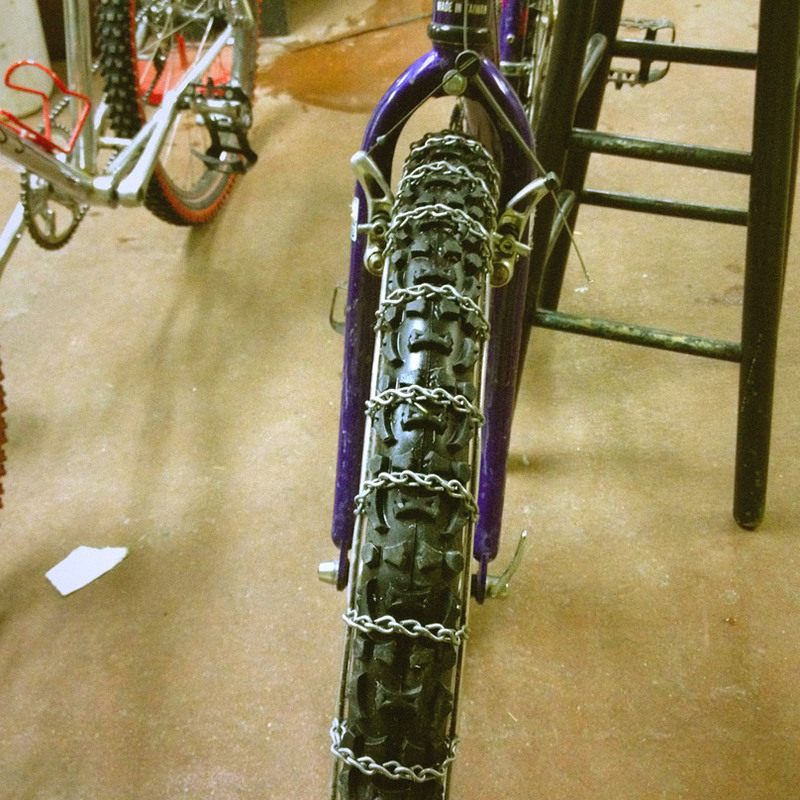 4) Comparing the weight of full on chains to a regular studded tire, they’re a lot heavier. They’re also A LOT slower. You could treat this as a pro for two reasons 1)You’ll be generating a lot more body heat and 2)You’ll be strengthening your leg muscles. Beyond that though, you probably won’t be winning any races (unless your competition falls on the ice because they’re not riding with tire chains). 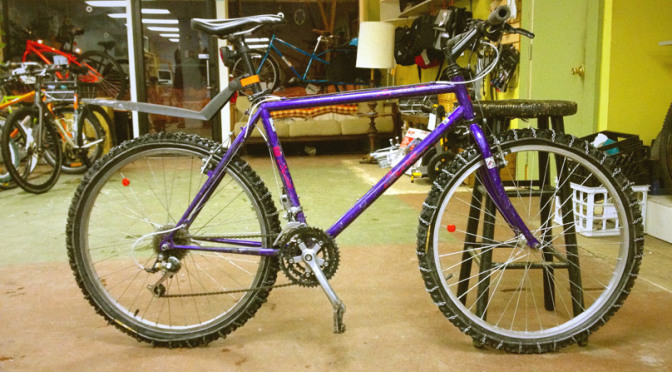 While easy to install, finding the right bike with the right tire combination may be a challenge. It took me a couple of tries to acquire the right one. In more urban environments, with consistent plowing, they feel like overkill. I used my set a small handful of times, but found the inconsistent chain rubbing to be slightly maddening. But if you’re living in an icy place where pathways tend to be hard-packed snow, they are quite fun, so you may find these are the right choice for you.